Episode 2 of BU All-Access, shown previously on NESN, is now available on YouTube. This episode focuses on the Red Hot Hockey game at Madison Square Garden, the two-game series against BC and former BU linemates Jack Eichel and Danny O’Regan, now playing in the NHL. The 2018 IIHF World Junior Championship gets underway in Buffalo today with all five BU participants seeing action. Team USA, with sophomores Jake Oettinger and Patrick Harper and freshman Brady Tkachuk on the roster, faces Denmark in its first preliminary round game. Puck drop is at 8:00 p.m. ET. Blueliners Dante Fabbro and Kasper Kotkansalo will be opponents when Canada meets Finland, beginning at 4 p.m. ET. Both games will air live on the NHL Network. 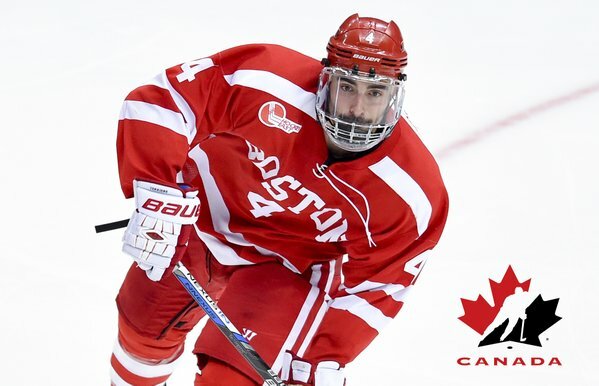 Fabbro’s availability had been in doubt due to a lower-body injuring that had restricted him to just two practices since BU's last game on Dec. 9. However, it was announced today that he will be on the final roster. The sophomore, who was a Nashville first-round draft pick in 2016, had previously been announced as an assistant captain for Canada. ● NHL.com full NHL Network WJC schedule. Terrier captain Brandon Hickey also will be in action, wearing the Maple Leaf today as a member of Team Canada at the Spengler Cup in Switzerland. Canada takes on Dinamo Riga in the first round game. The games will air live on TSN (schedule).